The Suite Hotel is uniquely positioned on the rising hills of Beirut, with views of the beautiful Mediterranean and the rolling hills of Mount Lebanon. The Suite Hotel is quiet, comfortable and very well priced, with arguably the best value rooms and suites available in Beirut. Our friendly and multilingual staff is more than happy to assist you in finding everything you need. The Bar Lounge has a trendy and modern design with a double height ceiling. It mesmerizes the senses with the lively colors, the pleasant lighting and the private lounge corners. The grand lobby at the Suite Hotel has large and relaxing leather lounges, a stylish dining area, with a large screen TV, and a friendly reception with direct access to the conference centrer, the restaurant and other amenities. It is situated in the Jal-El-Dib District, just seven minutes drive from down town Beirut. The Suite Hotel is on a main street, and amid a busy area of shopping and entertainment activities. 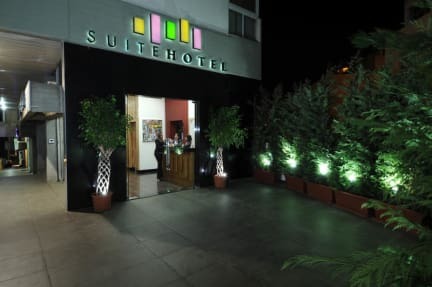 The Suite Hotel is situated a short 7 minutes drive from Beirut central district, and only 12 minutes from the Airport. It has a central location to all tourists' attractions in Lebanon, from Tyre , Saida, Beitteddine, through Beirut and Jeita to Harissa, Jounieh, Byblos , Tripoli , and the Cedars. It is only few minutes away from the Damascus Highway leading to the spectacular Bekaa Valley , the Qaraoun lake, Zahleh, and Baalbeck. The Suite Hotel has 44 large rooms and Suites divided to 4 categories; Family Suite, Deluxe Double, Junior Suite and Executive Suite. It offers affordable and elegant accommodation for families, couples and singles. All suites have modern and stylish décor, and are equipped with a kitchenette, satellite TV, a large bathroom and many more facilities.